Snappa is the easy-to-use, fast, and free Photoshop alternative. If you’re here because Photoshop is slowing you down, you’re not alone. ...you shouldn’t have to open Photoshop, size the image and text correctly, ensure your file has the proper settings (so it doesn't become pixelated when shared) and then finally save the file and upload it. Photoshop and Illustrator are great, but sometimes I just need something quick and simple, no need for a full on graphic design. This looked quick and easy. Saving time is a god send. Work smart, not long. My photoshop skills are "intermediate" at best. I can make lovely media posts, but they take me FOREVER. I was so excited to see that the templates made my life INSTANTLY a lot easier! I need to find all the corners I can cut without sacrificing quality. I could do graphics in Photoshop or Illustrator, and I have in the past and enjoyed doing it. But it just takes too much time. 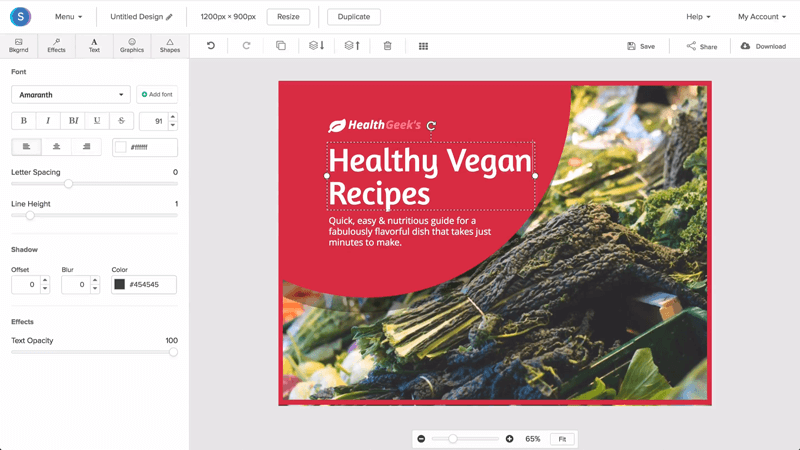 With Snappa, you can whip up graphics for social media, ads, blogs, and more in seconds. It’s easy to use, fast, and everything’s included. To create an eye catching graphic, you don’t need to waste hours navigating Photoshop’s overwhelming selection of tools, effects, and menus within menus. Snappa keeps the features you need in Photoshop, makes them easy to use (and find), and strips away the waste. Now you can create and share professional-looking graphics in seconds. You know the drill. Run into a snag, Google “how to do xyz in Photoshop,” watch lengthy (and boring) tutorials, hack together a solution, and then do it all again. With Snappa, you’ll create professional graphics without ever watching tutorial videos or reading how-to posts. It just works. Of course, help is always available if you need it (you won’t). Have you ever spent a lot of time creating a graphic in Photoshop, only to have it look wonky and pixelated when you post it on social media or your site? With Snappa, advanced edits are always a point and click or drag and drop away. Plus, ideal image dimensions for social media, websites, ads and more are available as presets. You can even resize a graphic for another platform in a couple of clicks. I just finished creating my first image and I love Snappa already! I always wondered how people made these kinds of images, and just assumed I’d have to go through the painstaking process of learning Photoshop (the horror). This was perfect. Literally everything I needed was available, easy to find and self-explanatory. Photoshop is made for designers with top-of-the -line hardware. For the rest of us, it’s cursors that freeze in place, loading screens that stay that way, and graphics that take forever to render. By giving non-designers everything they need to make snazzy graphics (and nothing they don’t), we’ve managed to keep Snappa lightweight. Expect it to hum along in your web browser and move as fast as you do. With Photoshop, you’ll waste time looking for photos and graphics from other sites, downloading them, checking licenses, uploading to Photoshop, and finally editing them. Fortunately, Snappa has everything you need inside. That’s 1,000,000+ HD 100% royalty-free stock photos, 70,000+ graphics and icons, and 200+ fonts. Plus, you get free access to our growing library of professionally-designed customizable templates. Without expensive upgrades, sharing your Photoshop graphics to social media is a chore. You need to manually resize your image for each platform, save it, open each social media account, upload your images, and craft your message for each platform. In Snappa, you can resize your graphic and share it across platforms in a couple of clicks -- without ever leaving Snappa. And if you connect your Buffer account, you can pre-schedule your posts, too. Let me just say that Snappa is making my life better. For years I purely used Photoshop but your templates and the ease of use of your software just makes it all so much quicker and nicer looking. If you’re tired of searching through multiple stock photo sites for free images, paying royalty fees for the best ones, or hiring designers -- you’ll love Snappa. Included in the software is a growing collection of 1,000,000+ HD royalty free images. You get access to all of them inside of Snappa, even on our free plan. With Photoshop, you’re either designing from scratch or paying extra for template packs. And your templates won’t keep up with changes to social media and ad dimensions. In Snappa, all of our templates are 100% free, our designers are always adding more, and they’re always optimized for each platform. It’s never been this easy to create attention-grabbing graphics for social, websites, ads, and more (without stressing over costs). After your free trial, you need to pay $19.99/month to continue using Photoshop. This price doesn’t include templates, other Adobe products, or any courses you may take. With Snappa, you can stay on our free plan for as long as you like. You get access to all our of photos, graphics, and templates. You even get access to nearly every feature (including image resizing). And if you love Snappa and want to upgrade, it’s only $10/month (no add ons or hidden fees). Thank you so much for your product! I have already gotten my money out of it! Ready to give Snappa a try? We’ve covered a lot, but we don’t want you to take our word for it (or even a customer’s word). Try Snappa risk free. Get access to advanced features like image resizing, and all of our stock photos, graphics, and templates by signing up for our free plan (no credit card required). Click here to get started.